Weekly Update 2018-41: Once again Joel Plaskett graces my blog with his folky tunes, shirt buttons on the right/wrong side and the saddest houseplant in the world. This weekend marks a very special ritual I get to enact with my very good friend Kaylin: the wonderful drunkenness that can only be provided by Kitchener/Waterloo's Oktoberfest. The very first one we attended together in 2014 included a performance by our favourite Canadian musician Joel Plaskett with his band The Emergency. So yes, I have mentioned Joel in a previous post, but he deserves another one for the band itself. After Plaskett's first band Thrush Hermit disbanded, Plaskett found his commercial voice with The Emergency, which he developed alongside his more personal solo work. I absolutely love all of his discography, but the first Emergency release Down At The Khyber is truly one of the albums of my youth. It has a raw feeling of youth to it that I have certainly felt growing up in Canadian nature, but with a proud poppy tune that's a bit more mainstream than Plaskett's solo work. Check out 2001's Down At The Khyber below. I am facing you from the other side of my first week of work at my new job, which is something of an accomplishment in itself. I have already tested out a great bike route, though I must admit it is something of a challenge on the way home, all the way up a big hill without many flat spaces in between. I did a little preliminary exploration around Parkdale (mostly because Ritual was offering free food all week in Parkdale), but I still have more to see for sure. As mentioned above, I'm headed out to Kitchener to visit my friend Kaylin and celebrate Oktoberfest for the weekend. 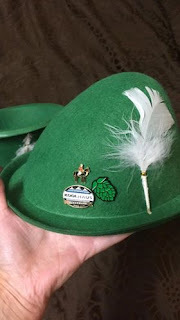 This is our third Oktoberfest together, and I've even got my alpine hat all ready to go. Shoutout to Toronto Brewing for their super-cute Hops pin. If you wear what society deems as “women's” clothes, especially button-up shirts and zippered hoodies, you'll immediately know when you're wearing a unisex or men's version because the buttons or zipper will be on the opposite side. I personally don't believe in gendered clothing, but I did wonder how this phenomenon came to be. It's not as though women are left-handed and men are the opposite, I certainly am not left handed. All the same, I've become pretty used to buttoning up my own shirts. I did have a pretty random thought about the possible origin of this, which was that heteronormative relationships were certainly the norm when this button system was developed (even now we're globally not quite at the point where all types of gendered relationships are considered normative), and so perhaps gendered clothing was reversed so that partners in a relationship could assist each other in buttoning up their own shirts. If a woman is used to buttoning up her left-side buttoned women's shirts, then to assist her husband to button his shirt, from the outside view, would be the same experience for her. Obviously the reverse is also true. Though, of course, who even wears button-up shirts anymore? Maybe this entire notion is completely outdated. I was astounded to learn that one of the most common houseplants, the pothos, leads quite the sad life. Apparently pothos have lost the ability to bloom and flower. While sad from an aesthetic perspective, this is also somewhat creepy because it means no more pothos can be grown. Seeds from flowers are how the plant propogates, which means all "new" pothos come from cuttings of previous pothos - no true new plants can ever be created again. 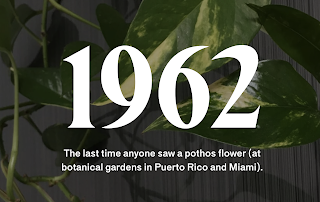 1962 was the last year anyone saw a pothos flower. While this information is shocking, I actually included it as inspiration because I absolutely love the way it's designed. I have never seen an online article laid out on a webpage like this, with such interesting rhythm and flow. I'm obsessed with using the web as a medium for new ways of storytelling (though admittedly you don't see much of it from my own blog), but I really enjoyed the way each tidbit of information is broken into its own card for easily digestible content. I think next week's inspiration may be about the creators of this content...you'll just have to wait and see, though.